Blue Stars alum Kathy LeMahieu Roeder submitted this photo and caption. My son, Jason, saw his first drum corps show in 2006 at the Blue Stars "home show" in LaCrosse, Wis. He was six at the time. At the end of the show the Blue Stars do a standstill performance and a ceremony to recognize the organization's graduating "age-out" members. It's customary for all alumni to come to the 50-yard line seats to watch the performance, so I took Jason up on the steps. Tyler Shipe, the drum major, came into the stands to direct the corps. He turned around to my son sitting right behind him and asked him if he would hold his helmet. Jason was awestruck and sat completely still while Tyler directed, holding the helmet like it was made of glass. 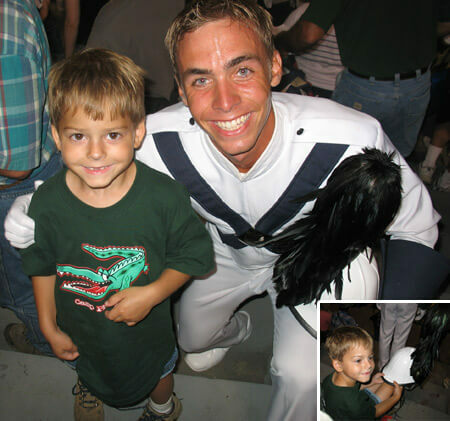 Tyler made Jason a life-long Blue Stars fan that day.